You may see tire coding written differently. Sometimes It's written with x, -, or / separating the numbers. Tire manufactures for ATVs use these numbers to deliver information about the tire, like a description. Here is how you break it down. The "25" in the listing above represents the tire's height, in inches, when it is properly inflated. 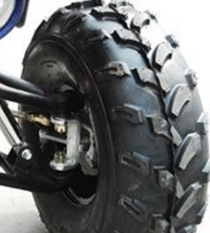 Most ATV tires range in height from 18 - 27 inches. The "18" in the measurement represents the width of the tire. Said another way, it is the tire's footprint width when on the ground and properly inflated. The "12" in the list above represents the diameter of the wheel that this particular tire is designed to mount. In other words, this number is key to making sure the tire fits the rim of the wheel. There you have it. Once it is broken down, it all makes sense. Just be sure you order the tires with the numbers in the proper sequence to avoid any issues. Now put those new tires on and hit the trails!